These Crispy Italian Oven Roasted Garlic Potatoes will quickly become one of your favorite side dishes. These roasted garlic potatoes are perfect for every day fair or holiday entertaining. Crispy on the outside; tender on the inside. It happens every. single. time. I am, of course referring to the fact that every time I visit a farmers’ market, I get a little excited and carried away. 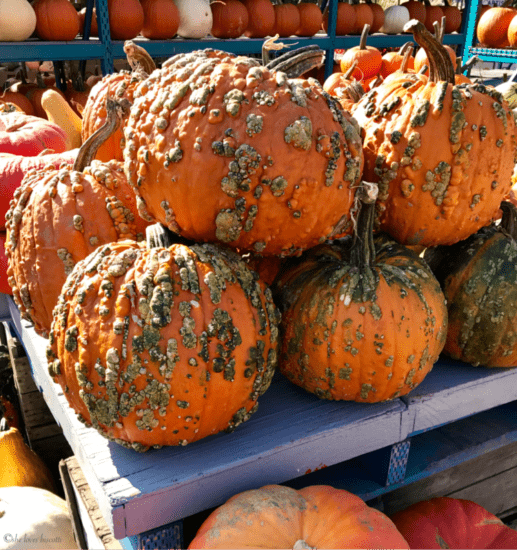 I mean, how can you resist pumpkins with warts? So, when I visited Atwater Market, a local Montreal farmers’ market, my intentions of not buying literally everything escaped me. Thank goodness my husband and son were present to help carry all the wonderful fruits and vegetables we purchased. Hopefully… eventually… some of these season appropriate vegetables will make it to the blog. I say this as I am thinking of the two (yes, two!) five pound bag of beets which have been temporarily parked in my cold room. I must get to those before the end of the week. But today… today, my friends we are talking spuds. In the past, I have already shared a few potato recipes with all of you. These Potato Croquettes are, without a doubt, one of my all-time favorites. Did you know they could be made with leftover mashed potatoes? This is truly a great recipe! Another family favorite are these Garlic Smashed Potatoes. What can I say except we love crispy oven roasted potatoes. The good news is that I have yet another recipe to share with all of you! If you have ever wondered how to roast potatoes, this is the recipe for you! The combination of garlic, potatoes and lots and lots of herbs makes it the perfect side dish. There are literally thousands of potato varieties available. I am sure you know by your own experience that certain types of potatoes lend themselves better to specific methods of cooking. That is because potatoes have different textures. This sliced roasted potatoes recipe requires red potatoes. have a full flavor with a hint of sweetness. This is the spud for us today! Are you ready to make the best garlic roasted potatoes? The whole process begins by peeling and soaking the sliced red potatoes. Cut them in quarters if they are large or in half if they are medium sized. While the red potatoes are soaking we can get started on chopping up all the wonderful herbs that we will need for this recipe… rosemary, parsley, sage and lots and lots of garlic. We are making roasted garlic potatoes after all 😉 If you like heat, the addition of chili pepper is a must. Speaking of heat, we need to turn on the oven to 425° F (220° C). Place one oven grate at the bottom and one in the middle. We will also need a roasting pan large enough to fit all the potatoes in a single layer. Another must is a high quality olive oil. So, once the soaking period is done, drain and pat dry the potatoes. In a large bowl, toss the potatoes with the olive oil, herbs and spices. Make sure the potatoes are well coated with these wonderful herbs, spices and olive oil. Next, drizzle a little olive oil at the bottom of the roasting pan and brush it across the entire surface. Arrange the potato halves (or quarters) in a single layer, flat side down. In the oven they go… 15 minutes at 425° F (220° C) to begin with. The heat then needs to be lowered to 375° F (190° C) for another 35-45 minutes or so. During the last 5 minutes, transfer the pan to the middle of the oven and turn on the heat to broil. Now, at this point you need to keep an eye on these potatoes in the oven. We want crispy roasted garlic potatoes not burnt ones. When they appear golden and crispy, they are done! Remove the pan from the oven and allow them to stand for a good 5 minutes. Almost magically, the oil will be re-absorbed in the potato… I bet you can’t wait to taste that roasted garlic potatoes goodness! If you like red skin potato recipes, you must try this Italian Potato Salad. My mom would only use garlic, fresh parsley and oregano when making these roasted garlic potatoes. I love to add fresh sage and rosemary, so I’ve included these wonderful herbs in the recipe and with great results. Simple and wholesome ingredients for a tasty and simple side dish. THANKS SO MUCH for following and being part of the She Loves Biscotti community where you will find Simple & Tasty Family-Friendly Recipes with an Italian Twist. ★★★★★ If you have made this Italian Roasted Potatoes recipe, I would love to hear about it in the comments below and be sure to rate the recipe! These Crispy Italian Oven Roasted Garlic Potatoes will quickly become one of your favorite side dishes. Crispy on the outside; tender on the inside. If desired garnish with more fresh herbs. Peel and cut potatoes (cut in half if medium or in quarters if large). Soak potatoes in large bowl of cold water for 1-2 hours. Preheat oven to 425° F (220° C). Place one oven grate at the bottom and one in the middle of the oven. Brush bottom of roasting pan with olive oil. Set aside. Drain the water from the potatoes and pat dry. In a large bowl combine all the herbs and spices. Toss properly together with the potatoes. Arrange the potatoes in a single layer, with cut side down in roasting pan. Place on the bottom grate and roast for 15 minutes. Lower heat to 375° F (190° C) and continue to roast for another 35-45 minutes or so. No need to turn the potatoes over. During the last 5 minutes, transfer the pan to the middle of the oven and turn on the heat to broil. Remove from oven and wait a few minutes for the oil to be reabsorbed by the potatoes. Garnish with fresh herbs and serve. Please keep in mind that the nutritional information provided below is just a rough estimate and variations can occur depending on the specific ingredients used. The links on this blog are affiliate links,which means I’ll earn a small commission if you use those links and make a purchase within a certain time frame. The commission is paid by the third-party, there’s no extra charge to you. She Loves Biscotti is a participant in the Amazon Services LLC Associates Program. Amazon Associates is an affiliate advertising program designed to provide a means for me to earn advertising fees by linking to Amazon.com and affiliated sites. NEVER MISS A POST FROM SHE LOVES BISCOTTI! IF YOU ENJOYED THIS ROASTED POTATOES RECIPE, SAVE IT FOR LATER. PIN IT TO YOUR VEGETABLE SIDES BOARD! Follow She Loves Biscotti for more simple and family friendly recipes! Maria Vannelli is a registered dietitian who lives in a suburb just outside Montreal, Canada. She's the founder of the food blog She Loves Biscotti. Maria hopes to inspire you and bring you and your loved ones closer together at meal times enabling you to create some memorable moments. I can so relate to getting carried away at the farmers market, Maria! We love crispy roast potatoes at my house, and yours look perfect, especially with all the herbs. Delicious, as always! Thanks so much Colleen! We also love our roasted garlic potatoes. You know what they say, birds of a feather… ♥♥♥ Thanks for stopping by. Have a great week-end! Yummy! Roasted potatoes! These are the dishes I grew up with! Good old potatoes, skin removed (never had a potato with the skin on until I arrived in Canada), soaked in water, dressed in the best quality e.v.o. oil, garlic, herbs (usually rosemary or oregano), a bit of spice (which never hurts 😉 and then roasted to perfection. Yours look incredible and I would eat them every day!! I love oven roasted potatoes. I could probably eat them every day, and these look soooo good! I completely agree about olive oil quality, it makes all the difference! This recipe looks delicious! I also like to go to farmers’ markets with my husband, and I have the second of two 5-lb. bags of beets sitting in my fridge! I’m glad I am not alone 🙂 Thanks for stopping by Cathy! I must admit, I could make a meal of this on their own rather than relegate them to a side dish. The crispy exterior well seasoned along with a creamy interior, what could be wrong! My mom used to make these too. I tried to duplicate her recipe but could never get them crisp on the outside. Will definitely try your recipe. Getting hungry just thinking about it! Thank you. Hello and Welcome to She Loves Biscotti! I'm Maria: dietitian and full time content creator. Join me as I share traditional Italian recipes from my youth, to modern twists on classics using fresh and seasonal ingredients. Links on this blog are affiliate links, which means I’ll earn a commission if you use those links. (There’s no extra charge to you).